Adding a heavy splash of vanilla to the custard mixture (the eggs & cream) really turns this into a French vanilla & maple-flavored breakfast indulgence. Using all-American cinnamon roll dough in place of the traditional sliced French bread creates layers that have an interesting texture, spiced flavor, and feeds a crowd at the same time. For a company brunch, use an oval 3-quart baking dish if you’d like. Then you can scoop out servings and drizzle them with the warm glaze & maple syrup. This French toast bake is equal parts delicious and easy. 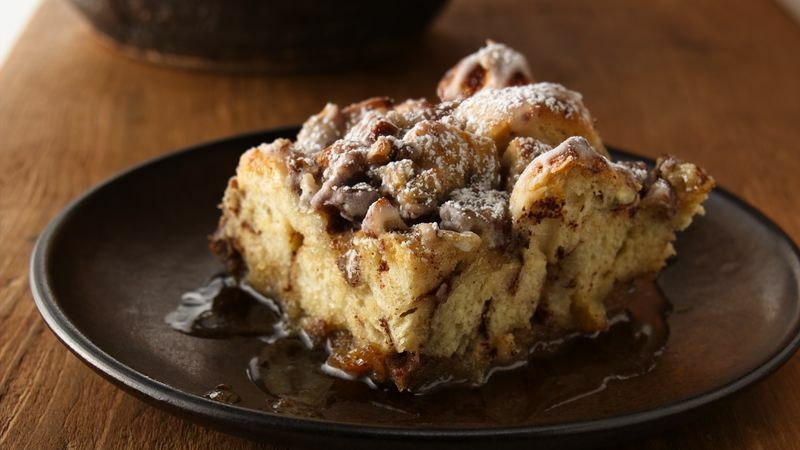 Using two cans of Pillsbury cinnamon rolls, this recipe is ready in an hour and gives you the best excuse to eat dessert for breakfast (double win)! Icing not your favorite? Some common French toast recipes are dolled up with whipped cream and syrup instead. You can make French toast savory, too! This Bacon and Cheese French Toast Bake is one of our favorites.. Did you know that the earliest versions of French toast dates back to the Roman Empire? The recipe was later brought to America by the early settlers. In France, the dish is called pain perdu, meaning “lost bread.” To learn how to make French toast to feed a crowd, check out our go-to guide. Big breakfast fan? Browse through our awesome breakfast casserole recipes that features more French toast recipes and beyond.